cuteapps: PDF to Word - Convert PDF to doc, word files. 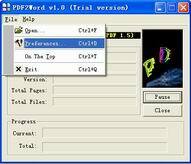 PDF2Word(pdf to word) software enable export the text, images and other contents from pdf document into word document, so you can reuse your PDF content, pdf to word software will preserving text, layout and bitmap images in the generated word document. PDF2Word(pdf to word) software is a standalone program and does not require Microsoft Word, Adobe Acrobat, or even Acrobat Reader. Convert PDF to word/doc/rtf files.